My first impressions of this box are really great! The MUN sample was the first thing to catch my eye as I've read some amazing reviews of this serum. I love nail polish and I've not tried any from NCLA before so can't wait to try out this gorgeous pale blue shade. The other brands included are new to me. EVOLVh are a luxury natural haircare brand - intrigued to try out this shampoo/conditioner duo, although they have quite a strong perfumey scent like conventional hair products which is unusual for a natural brand! Last up there's the cleanser from the brand TAY. I love the look of the wooden packaging but unfortunately some of it leaked in transit! The product itself sounds great, but I haven't been able to find a full ingredients list online yet so I'll definitely be trying to find out before I use it! This month's box is worth around $40 (approx. £23) which is excellent value for money if you live in the US, but international customers also get more than you pay for too. 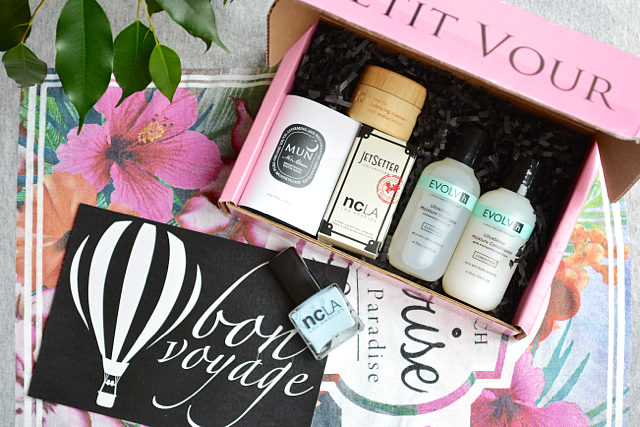 The monthly subscription to Petit Vour costs $15 in the US, $23 in Canada and $30 (approx. £17) to ship internationally. I love the contents of this month's box and totally recommend giving Petit Vour a try, especially if you're becoming more conscious of the ingredients in your beauty products and looking for cruelty-free alternatives. Plus, who wouldn't want to get a fun pink box delivered to your door each month filled with luxury ethical beauty products?! Are you tempted to try Petit Vour next month?! It's such a great box this month! I've wanted to try Tay for ages and I'm sure when I checked them out they were all good ingredients wise. Definitely a great selection of brands. I just got this box and it's such a good value! Especially if you live in the US...can't beat $15. The MUN sample alone is worth around $7! Hadn't heard of this box nor Vegan Cuts. But still worried might get stung with customs charges so will stick to SoukSouk which I love.